What is black, brown, red, green, white… and sticky? Rice is the most important staple food worldwide, after corn. It is also the defining, anchoring theme of Rice, in Nolita. Off of a quietly unassuming stretch of Elizabeth Street, neatly tucked away between apartments and a bakery, the narrow doorway gives way to a cool, sun-lit, brick and wood paneled room, that barely fends off the bamboo garden pressing up against the open back windows. Rice features rice cuisines worldwide- Asian, European, African, South American, Indian and Caribbean, such as Mexican baked black beans, vegetarian meatballs, Thai coconut curry, lentil stew- all paired with different styles of rice. Rice based teas, in addition to more traditional chai and Morrocan mint, also make brief appearances on the menu. Their brunch menu* diverts to the road-less-traveled-by, and is a pleasing change from the usual eggs and French toast. 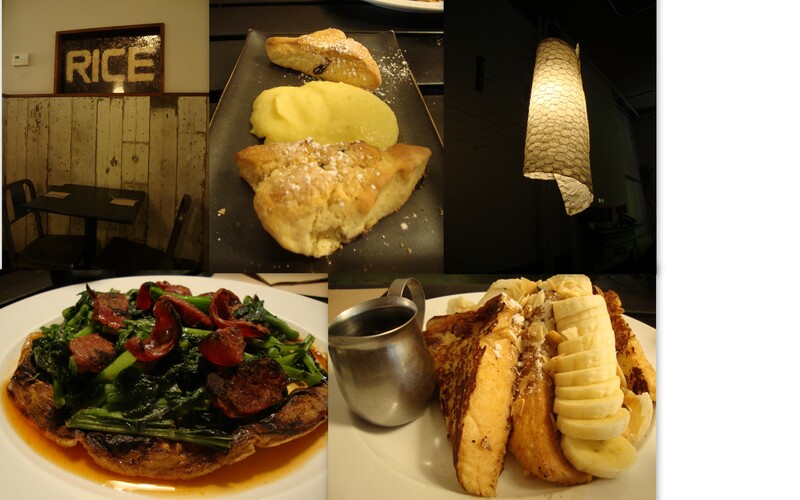 But- they DO have eggs and French toast, with an added twist: Rice themed. The prix-fixe menu affords lots of choice and opportunity. After drinking coffee, freshly pressed orange juice, tea AND water delightfully served in glass milk jugs, it was on to the next. 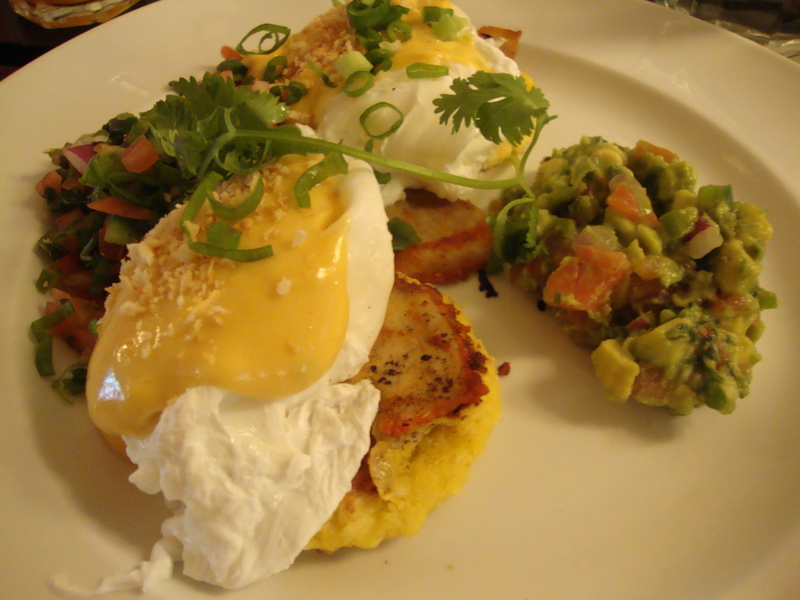 The Rice Benedict, or eggs benedict, sit on a bed of sweet corn arepas (ground corn and rice dough, grilled or fried), topped with a dash of lime hollandaise and avocado salsa (me + Jamie). The Open-Faced Frittata combined unusual flavors of sweet chili sauce and sweet chorizo sausage, harmonizes sweet and savory (Nika). By far, the most intriguing item on the breakfast menu was the Coconut French Toast (Jess), served with lime syrup and bananas- and it was heavenly (Rice could have just as easily been called Lime- they have lime in just about everything, they even make lime curd instead of lemon curd). The Sweet Cream and Rice Scones were so good, I ordered seconds- made with rice flour and infused with orange essence. However, I was disappointed to see that Rice did not include one of the most basic and popular rice-based drinks in Central America, horchata, which combines cinnamon, coconut and rice milks, sugared up, served ice cold. Or a lack of rice milk as a beverage or milk substitute period. Even some obvious rice dishes, such as mochi, were no where to be found. To Rice’s credit, among the foray of seasonal fruits bowls, honey/granola yogurt, Rice sticks with its theme to the bitter end- even going so far as to list Rice Krispies with milk ‘n’ bananas as a brunch menu item**. If I could give out stars, and if anyone would even take them seriously, I give Rice 3 1/2 stars: unique, great atmosphere, super affordable, delicious, healthy and just enough of that hole-in-the-wall-blink-and-you-will-miss-it kind of culinary treasure that I love. * Drunk fans should go for the Bottomless Brunch which includes endless mimosas. **Rice Krispies are delicious, by the way. i’d pay attention to your stars!